This is one in a ridiculously infrequent series of posts reviewing various beers from Innis & Gunn. Previous installments have featured reviews of I&G Original and Rum Cask editions. 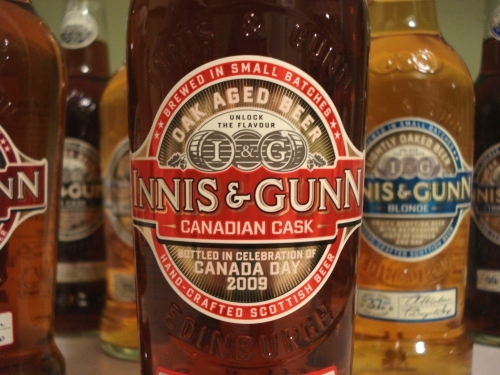 It’s Canada Day here in, well, Canada, and it seems like as good a time as any to revive this long-delayed review series to take a quick look at their Innis & Gunn Canadian Cask edition – if only because seeing the disgustingly prolific output of local beer blogging newcomers like Chris at Toronto Beer Blog and Jordan at St. John’s Wort has me feeling as guilty as ever about so often neglecting this poor little blog of mine. Canadians reading this may know the story of why a Scottish brewery saw fit to create a beer that celebrates Canada Day, but for those who don’t, here’s the scoop: Canada – especially Ontario – has been a hugely successful market for Innis & Gunn, with their Original being the top-selling bottled UK beer at the LCBO in Ontario, and other editions of the brand also doing extremely well. With a ruby-brown colour and a small off-white head, it looks great in the glass, and smells quite nice as well, with notes of dried fruit, spice, maple, and mellow rye whiskey. The flavour is quite fruity off the top, with raisin and orange accompanied by maple and toffee, all balanced by a peppery rye whiskey character to end. The beer was brought back this year in a 2010 edition, and while I haven’t had a full bottle of the new version yet, I did get the chance to have a small sample a couple of weeks ago, and found it quite similar to last year’s. The main difference I noted was that the flavour seemed a bit rounder and softer, with the peppery rye notes moved a bit into the background. Still very good, though, and worthy of a place in the rotation for Canada Day beer drinking even despite its foreign pedigree. After all, if you go back far enough, most of us (or our ancestors) came from somewhere else, and that mix of cultures is one of the reasons this is such a great country. Happy Canada Day! This entry was posted in beer reviews and tagged ale, Canada, UK. Bookmark the permalink.